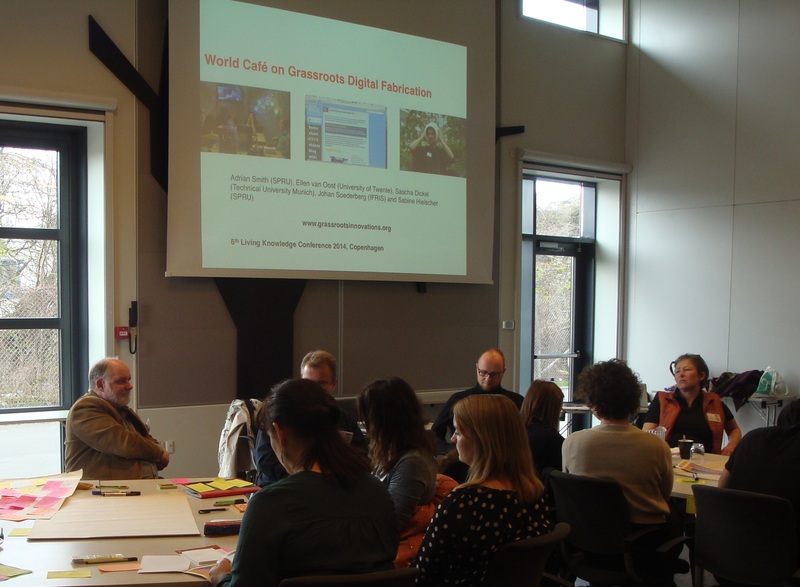 As part of our CIED activities and with support from Ellen van Oost (University of Twente), Johan Soderberg (IFRIS) and Sascha Dickel (Technical University Munich), we recently ran a session for practitioners and academics involved and interested in grassroots digital fabrication. It was held as part of a wider conference considering an Innovative Civil Society organised in Copenhagen by the Living Knowledge network of science shops over 9th to 11th March 2014. Much of the conference was about citizen science i.e. involving citizens in scientific knowledge production, yet about thirty people turned up to our session wanting to hear more about and discuss grassroots digital fabrication in Hackerspaces, Makerspaces and FabLabs. Such labs and spaces are community-based workshops that enable people to access versatile digital design and fabrication technologies, and join together in collaborative projects where they can make anything they wish. Workshop members meet up at regional, national and international events and are networked through social media and on-line resources. Many cities around the world have or are opening grassroots digital fabrication workshops that are extremely diverse. Our session started off with three local practitioners’ presentations: Vanessa Carpenter (Illutron Collaborative Interactive Art Studio), Michael Hviid Nielsen (Copenhagen FabLab) and Oyuki Matsumoto (STPLN Open House Makerspace), and was followed by a World Cafe discussion on grassroots digital fabrication. Whilst our session generated a wide variety of insights, the one we would like to draw out here was the repeated emphasis on the material and emotional aspects of grassroots innovation, in particular the role these play in the building and nurturing of a community of workshop practitioners. Feeling excited about taking things apart to see how they work, and generally having fun making and thinking about them, and wanting to share this with others all seem to be crucially important for people to be actively engaged in these workshops. Perhaps this is obvious, but at times the wider conference seemed so focused on techniques of public engagement and participation in knowledge production that it seemed as though some simple fundamentals of community development (such as the importance of creating shared emotional connections) were overlooked. Building a community was key to the success of the three local workshops that gave a presentation at our session. In the context of grassroots digital fabrication, the combination of building material things in projects, at the same time as developing social bonds and building emotional connections, are all important aspects when trying to build a community of practitioners. The more established workshops demonstrated this, whilst newer ones that had relatively recently opened their facilities were only beginning to appreciate how important community building is to get people involved and stay involved in these workshops. STPLN in Malmo was an interesting example because the facilities (which were at first under-used) co-evolved over time with the development of a community. The STPLN team realised that giving people access to technologies and facilities was not enough. The atmosphere within workshops needed to allow people to feel playful and accepted, where they could be excited about experimenting with things, collaboratively create their own activities within the space, and develop a sense of belonging. Some of the practitioners commented on how people who got involved in projects, stayed involved in subsequent activities because they became inspired by making things together. Sometimes people are experimenting purely for fun, while at other times they are grappling with wider social goals. For example, Vanessa described how at Illutron, an arts-based workshop, they try to facilitate enjoyable and playful public events in order to stretch and inspire people to think about social interactions in different ways, and at the same time draw them into their workshop activities. Michael from Copenhagen FabLab noticed how learning simple fabrication techniques whilst doing a project, could spark ‘leaps of creativity’ and inspire ideas for other projects that drew people into developing other skills, and therefore on-going involvement in the workshop. Experimenting with material things and technologies, designing and making things together, and having fun through shared emotional connections seem to be key to the development of communities within workshops. Trying to encourage some workshop users to care about a common ethos (supporting open source ideas and shared knowledge production as advocated by most Hackerspaces, FabLabs and Makerspaces) was another part of the material and emotional dimension of building a community. Michael said that people and groups did not always document their projects, something important for designs and instructions to be freely available to others, even though this is an important part of the open knowledge. Cultivating a sense of belonging means that people need to feel welcome and confident about sharing but also to develop a sense of shared responsibility for the development of the workshop. Oyuki from Malmo STPLN described how the construction of their workshop evolved over time in order that participants could feel comfortable and hence participate and contribute. All the practitioners pointed out that it takes energy and hard work to create such an atmosphere (if it does not pre-exist). Here, nurturing a diversity of different workshops seems to be key: for instance, some workshops where people are keen to explore open source ideas, and others where people are allowed to pursue their own individual projects. In the end, the people who are involved in setting up these workshops can only go so far in creating atmosphere and physical space where people are encouraged to work collaboratively. Each member and his/her understanding of the workshop and the technology within it play a role in what the space is used for, how it is used and by whom, and what it becomes over time. Workshop communities seem to co-evolve with their membersâ competences, emotions and meanings, as well as the technologies and environments with which they surround themselves collectively. As we noted above, such emotional and material dimensions of grassroots innovation were only one aspect of the session’s discussion, and the one we have chosen to point out here. It did not form a focus for discussion, but kept popping up as we talked about other issues, like environmental sustainability, inclusion, and creativity. Nor did we focus on negative emotional elements, such as fearfulness, jealousy, and frustration; but likewise, these emerged as elements of the discussion. Obviously, there is more to the material and emotional building of communities of grassroots digital fabrication than we are able to go into here. In our own research, we are only beginning to appreciate these rich and complex features. But when much of the wider conference saw civic engagement in innovation as a matter of technique and best practice, we wanted to record a wider mix of features, which at times are very spontaneous and improvisational, but which have to be involved when cultivating a more innovative civil society.